I hope you were sitting down when you read that. Because shocking as it may be, Blog Party is (at least temporarily) back! Blog Party, for the uninitiated, is (the original!) a virtual cocktail party. Where friends & not-yet friends create wonderful bite-sized goodies & drinks in accordance with a monthly theme. Curious? Here's the round-ups of all previous parties. It's fun & easy. You 'bring' (post) a drink & nibble (as many as you want, for those of us who are over-achievers)(I'm looking at you, Cath) (Also, guilty as charged.) & I provide the music & decorations. It's a chance to flex your creative cooking/baking muscles & meet some new people. And maybe catch up with some old friends! 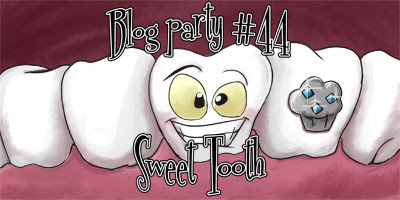 The theme this time is 'Sweet Tooth', perfect for the lead up to Valentine's Day. Make & post a small/appetizer/bite-sized sweet treat & cocktail/mocktail no later than Wednesday, 1 February & be sure to send the link to me (!) (thehappysorceress at gmail dot com). That Saturday, the 4th, I'll post the round-up with music & more to match. Any question? You know how to find me. Okay, gotcha! I haven't done anything like this in forever :) Nothing like a match under my Hmmm to get me going! I'm happy to be the match! Yeah, felt it was time. Can't guarantee how frequently it'll show up, but for now---it's back!